It’s like an extension of your walk-in closet, it’s easy, economic, and life changing for anyone who lives in a cluttered apartment or house. Created by Alan Mruvka, the founder of E! Entertainment Television, StorageBlue launches a unique service in StorageBlue Now, a convenient resource that drops off, picks up and then re-delivers personal storage bins when ever requested. Available now, residents in the New York metropolitan area and New Jersey will be able to store their extra belongings conveniently with the click of a button. With expansion plans to go national, StorageBlue Now’s initial launch gives residents in the New York metropolitan area (NYC’s five boroughs, parts of Long Island, northern New Jersey and portions of Connecticut) the convenience of additional space with the click of a button. 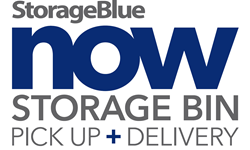 For just $22 a month, customers can go on the StorageBlue Now website (storagebluenow.com), schedule a drop off of four or more empty storage bins (within 24 hours). Once the bins arrive, the customer packs their belongings and schedules a pick up by one of the StorageBlue Now vans, which will then take the bins to one of their privately owned and secure storage facilities. Before taking the bins, the StorageBlue Now team will take photos of each of the bins and log them in, allowing easy access to re-deliver back any of the bins in storage. Customers have the ability to privately name bins, write a brief description of the items in each bin and see photos of the contents by logging in to their account on the website. The monthly cost includes four secure plastic bins and $6/month for each additional bin. StorageBlue Now will also pick up larger items too such as golf clubs, bicycles or skis for $10/month. Parent company StorageBlue offers solutions whether in need of personal or business storage, StorageBlue promises high-quality and secure, but most importantly, convenient self storage, with multiple sizes. From closets and small storage lockers, to over-sized garages and storage units, StorageBlue has a variety of sizes to fit any self storage needs. StorageBlue has four self storage locations serving the New York City and Jersey City areas, and offering onsite managers, temperature controlled and modernized facilities, free pick up, and moving supplies. One of a kind customer service including a lowest price guarantee and various specials, give StorageBlue the competitive edge. Open 365 days a year with extended office hours (8:00am - 8:00pm), this convenient storage facility ensures that you have holidays, weekends, or after-work hours to go and store your belongings, guaranteeing a smooth and easy transition in a typically stressful circumstance. Alan Mruvka, a self-trained entrepreneur, studied architecture at the University of Miami and New York’s Pratt Institute where he developed his passion for real estate, project development and community revitalization. He holds over 30 years of experience in the real estate and the entertainment industries. He draws upon his many years in the self storage industry to launch his newest ventures, StorageBlue and StorageBlue Now, but Mruvka’s most distinguished accomplishment to date is his monumental success in revolutionizing a genre of entertainment and celebrity-based news with the founding of pop culture network icon E! Entertainment Television. Now in its 31st year, E! Entertainment Television is a Comcast company that is valued at over twelve billion dollars. Mruvka has also produced numerous movies and television series after leaving E!